Recreating classic scenes from books or movies always brings out my fantasies of being a domestic goddess. I absolutely love hosting dinners at our home. When we were house hunting this spring, a large dining room was one of our top priorities, since we both love to have company. I have been daydreaming of carrying out a golden brown bird perched on a platter since I first started reading those touching, poetic scenes in century old novels. Holiday dinners are a wonderful excuse to cook up elaborate meals and pamper family and friends with tasty bites. Coming up with a menu is both challenging and fun. 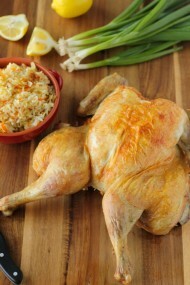 Just like the “little black dress”, roasting poultry is usually a great choice, since it’s is always classy and elegant. 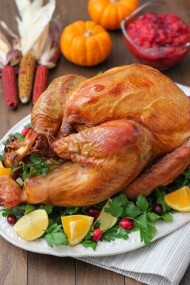 We have our usual suspects, chicken and turkey, but there’s also other birds to consider. Ladies and gentlemen, I bring you the duck. If you read any Russian literature, you will notice a theme of duck or goose making an appearance on special occasions. Even classic English novels feature these exceptional birds. They are just as momentous on a holiday table, but more exotic and extraordinary. Probably because they aren’t something you see very often. Back in the day, they were much more commonly grown in farmyards or brought back from successful hunting expeditions when that was the way of life. Now, we are much more familiar with chickens and turkeys. Actually, many people don’t even know where to look for a duck in the local grocery store. 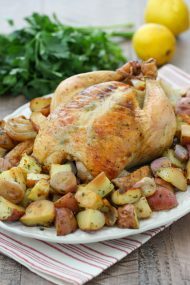 Even though roasting a whole bird is almost symbolic to being a successful homemaker, it’s also much easier than it seems and requires very little work and just a little know-how. Roasted duck stuffed with apples is a characteristic Russian dish and I can completely understand why both go hand in hand. The apples infuse the duck meat with their sweet, delicate flavor and tame the slightly gamey flavor that can be a little overpowering for some people. You can even bake some extra apples to serve on the side with the duck. Duck isn’t something to shy away from. With my step by step encouragement and detailed instructions, you too can have a Norman Rockwell moment with your next dinner guests. Duck has a lot more fat than other poultry, like chicken or turkey. To create a really crisp skinned duck, we will need to render as much of the fat out of the duck as possible. Prick the duck all over the breast and in all the fat pockets with a wooden skewer, a fork or a paring knife. Try to poke just through the fat, not all the way to the meat. Pricking the fat will help the fat to escape better as it is cooking. Trim off all the excess skin and fat on the duck. Pat the duck dry with paper towels. Season the duck with salt and pepper all over the surface of the duck and also inside the inner cavity. 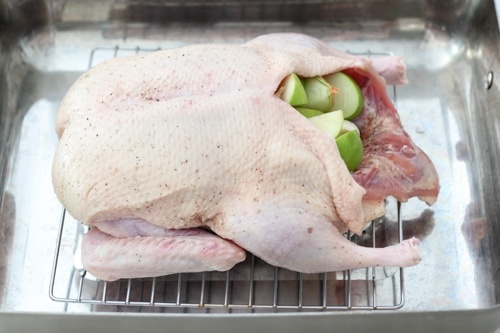 Cut the apples, onion and garlic cloves into sections and place them into the cavity of the duck. You can also add herbs, cranberries, lemon or orange and also dry fruit, such as prunes, apricots, raisins, etc. As the duck is roasting, all these aromatic fruits, vegetables and herbs will give an incredible flavor to the meat. The apples are especially delicious. The combination of roasting duck with the apples, onions and garlic is an aroma that will make your mouth water while you wait patiently for the duck to cook through. Tuck the wing tips behind the back of the duck and tie the drumsticks together with kitchen twine. Place the duck in a roasting pan on top of a rack. Pour enough water to cover the bottom of the roasting pan. 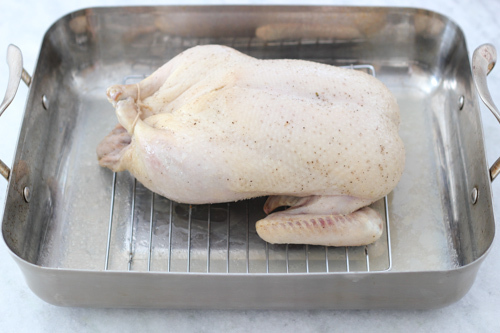 Cover the roasting pan with aluminum foil, or if you happen to have a roasting pan with a cover, use it. 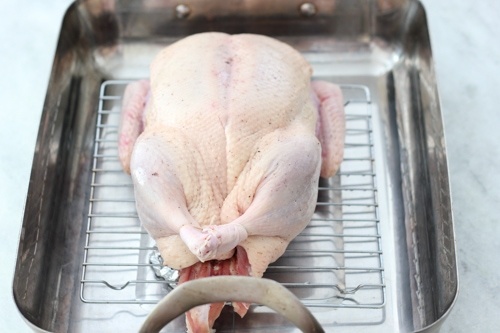 The water will prevent the duck fat from burning on the bottom of the pan and also will create a steaming effect while the duck is being roasted covered. This is another way to draw out the fat from under the skin of the duck. Roast the duck, covered, for about 45 minutes. Uncover, increase the oven temperature to 425 degrees Fahrenheit and roast for another 30 minutes. 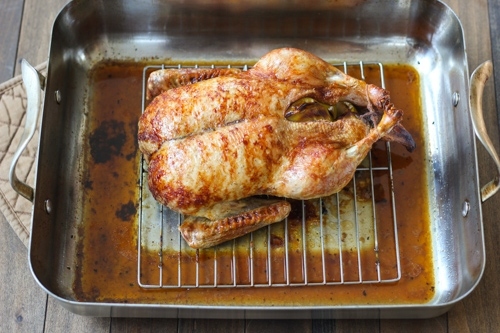 Increase the heat to 475-500 degrees Fahrenheit and roast for another 10-15 minutes, just until the skin is golden and crisp and the duck registers 175-180 degrees Fahrenheit in the thickest part of the thigh. Skim off the gorgeous duck fat from the roasting pan and save it to use for frying potatoes. Duck fat is incredibly flavorful. Let the duck rest for 10-15 minutes before carving it. Discard the aromatics that you used to stuff the cavity of the duck. Their main job was to flavor the meat of the duck. Usually, they will need a bit more time to be cooked to a proper temperature and by that time, the duck meat will be very dry and overcooked. I love trying new recipes too, Katy:). I hope the duck turns out great. Oooo, this duck looks pretty! I remember one year I decided to impress my new family with roasted goose for Christmas. Totally messed up the temperature and the bird was slightly black-ish! 🙂 But! The meat was awesome and everyone thought it is the way this bird should look like! I’ve gave up on the goose. Will try your duck recipe! Oh, no! I hope it will turn out better next time, Iryna:). Great story, though:). Some of the best cooking stories are the ones that don’t go exactly how we plan them to. I have plenty of those. I think that the apples add a lot of flavor to the duck meat, Valya. Thank you for the recipe. My husband just stepped out the door to shoot some ducks. He’s been bringing in ducks the past few weeks and I have no idea how to cook them. Will try this recipe ASAP. Thanks again! Good timing:). I’d love to hear what you think, Inna, once you make it. I have roasted ducks and geese. Geese have even more fat. There are traditional cooking techniques from south-western France that take advantage of the fat. A belated comment: I’ve made your “skillet cheeseburger pasta” twice during the last few days. (My biggest non-stick skillet is only nine inches, so I made your recipe in two batches.) I loved it. It’s a greatly superior version of a dish that was a constant mainstay of cafeteria menus when I was at university, forty-five years ago. All of the women whose cooking blogs I follow seem to be having babies. hilahcooking.com. mimithorisson.com. I hope your expectancy is still going well. Best to Nathaniel! Geese and duck fat are awesome to use in many other recipes, especially for roasting potatoes. I’m so glad you enjoyed the Skillet Cheeseburger Pasta, Patrick:). That’s awesome. Thanks for the well wishes. We are really excited about the baby. Olga thank you so much for bringing taste of home! I usually add full cup of prunes ( sugar free). The combination of sweet prunes and sour apple is great and will help to reduce the taste of fat. Chinese are cooking duck until skin is very very crispy and they serve plum souse with it. Many people that I know also like to add prunes as well as apples, Ulyana. I’m glad the recipe brought you a taste of home:). Hi, I’ve always wanted to try duck but am intimidated. This recipe looks great! I can only find frozen duck, how many days does it take for it to defrost usually? Also I can’t find kitchen twine anywhere… Is it ok yo omit using that? I would love to try this. Thank you. It really depends on the size of the duck. I usually defrost it overnight. You don’t have to use the kitchen twine, but it will be harder to keep the aromatics from falling out and the duck won’t be as neat and might not cook as evenly on all sides, but all of those are minor things. Hi, Olga! Thank you for the recipe, I will try it tomorrow. What temperature oven do you start with? 350 degrees Fahrenheit. Follow the instructions as I have them written in the recipe; I have it all detailed there. I hope you enjoy it, Elena. Hi Olga! I’m so excited to try this recipe as I’ve never cooked duck before. I’m cooking it this Saturday for my friend from Russia and 2 other people! Can you recommend what side vegetables or dishes would work with this Roast duck recipe or what would go well with duck in general. Rice Pilaf – sauté some minced onion, garlic and grated carrot until tender. Add the rice and continue with the recipe. Add fresh herbs at the end. You can also add some chopped apples and raisins or prunes in addition to the rest of the ingredients. It will compliment the duck perfectly. 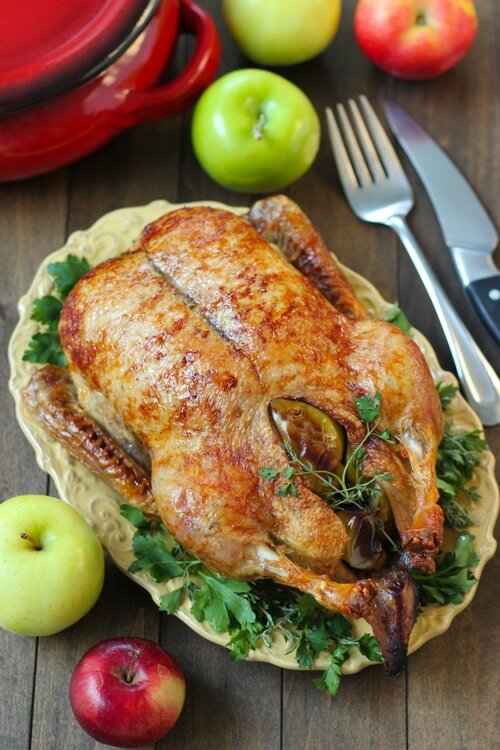 Duck with apples and prunes is a very classic Russian dish. Braised Carrots and Parsnips – instead of parsnips, you can use turnips or celery root, or a mixture of all of them. You can completely omit the parsnips and use only carrots. I know this is a lot, but I wanted you to have different options. Thank you so much Olga! They all sound and look so delicious! I will try them all at some point! For tomorrow’s dinner I will try the roasted potatoes and maybe the braised carrots. I hate to keep bothering you with questions but is there a particular sauce or gravy that I should make on the side? It seems like maybe a sweet sauce with the duck or just as it is would be fine. Hi Olga! I just wanted to say Thank you so much! Everything came out delicious! The duck was perfect! I can’t wait to try some of your other recipes! Thank you so much for taking the time to write, Diana:). I’m so happy to hear that everything turned out well. I’ll be trying this recipe tomorrow – using most likely the apples and prunes. Are there any herbs you would suggest us using? Basil? Rosemary? I’m sorry I wasn’t able to respond to you in time, Othilla. You can use whatever herbs you like. I prefer thyme and parsley myself, but it’s a matter of taste preference. I’m glad that it turned out well for you, Daria. I really appreciate that you took the time to write:). Hey Olga, trying out this recipe tonight and I’m wondering if you use the duck fat for frying potatoes on the stovetop. How much of the fat do you use? Thanks! Yes, you can definitely use the duck fat to fry potatoes – it’s so good! It’s hard to say how much oil to use; I kind of see how much they need. This recipe is very easy, however I tried this for New Years and duck requires more time to cook. 2 hours is not enough for 6 lbs. I recommend at least 2 more hours. After 4 hours absolutely delicious! I recommend using a thermometer to figure out how long to cook any meat. That is the most accurate.